It’s Time For Spring Paws! Spring is here paw-lovers!! Are you ready? These soft, suede wrap bracelets are the perfect way to celebrate the new season! Easy and fun to wear. Just wrap, tie and go! This soft suede was waiting for just the right design and l finally found it. 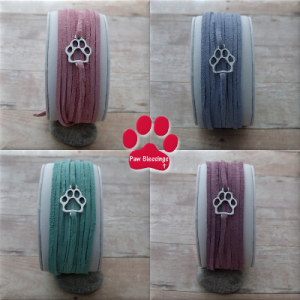 I love how each of these colors have the sweetest backdrop for the paw prints and they stand out perfectly. If you find the suede is too long for your wrist, you can cut it to size and just add a little knot on the end. The colors are right on for spring. Choose between 4 light colors in pink, blue, green and purple. See all of these beauties by clicking on the image below. Have fun! Tell me what you think. Leave a comment below. Thanks so much for stopping by! This entry was posted in Paw Blessings Jewelry and tagged paw blessings, paw blessings jewelry, wrap bracelet.